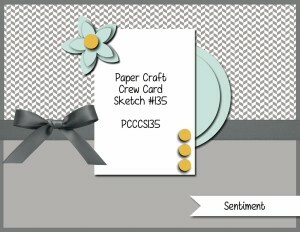 I’m back today with another card for a Paper Craft Crew Sketch Challenge #135! 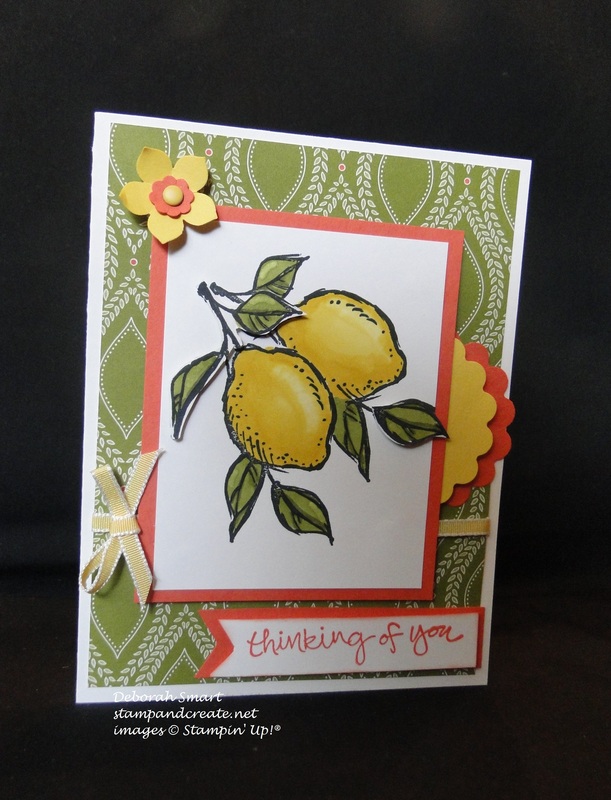 This is my first time using the lemon image stamp from this set, called A Happy Thing, which I got for FREE from the Sale-a-bration brochure. I really liked colouring this, and using the masking technique to stamp the 2 lemons one behind the other. I did use my Daffodil Delight and Old Olive Blendabilities Markers for the colouring – I know they’ve been discontinued, but as long as they are working fine, I will use them until they dry up. The lovely DSP in the background is from the Park Lane pack; it has some wonderful designs in this pack! The sentiment is from the Sheltering Tree stamp set, and the flowers were punched using the Petite Petals punch & a retired bitty punch, that could be substituted for the smallest flower in the Boho Blossoms punch. I used the 1 1/4″ Scallop Circle Punch for the scallops on the side, and just layered the 2 colours. The cardstock colours used in this card are Whisper White, Calypso Coral, and Daffodil Delight. The ribbon is the 1/8″ Taffeta Ribbon – I had some retired Daffodil Delight colour. Thank you, Jan! (I know you meant to say ‘Deb’ 😉 ) Thanks again for the wonderful inspiration you provide being on the design team at the Paper Craft Crew! 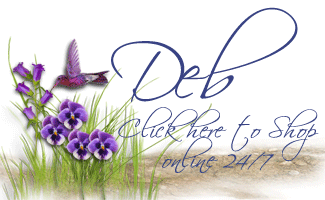 I love this card, Deborah. So happy! Deborah, gorgeous colors and I love how you turned the sketch. Thanks for playing along with the Paper Craft Crew.